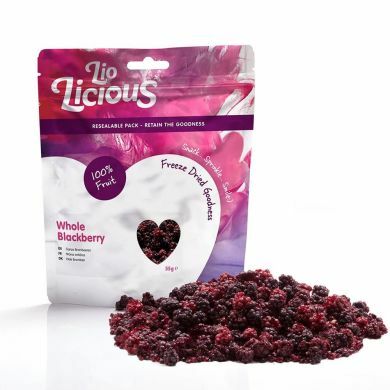 Freeze dried blackberries retain the sweet and slightly tart flavour of fresh blackberries - but because they are freeze-dried they don't need to be refrigerated and can be stored at ambient temperatures unopened for many months or for up to 2 weeks once opened. 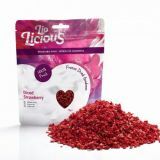 Ideal for adding as a topping to desserts or cocktails - they can be used in their dried state or soak briefly in water and re-hydrated. Pure fruit - free from preservatives, colours or flavourings. 55g of freeze-dried blackberries is the equivalent of 550g of blackberries. Just the water is taken away. Same size as the original fruit. 100% Blackberries. No added sugar or any other preservatives.